The number of voters impacted by new voting restrictions exceeded the margin of victory in close races in North Carolina, Kansas, Virginia and Florida. Bryan McGowan spent twenty-two years in the US Marine Corps, including four tours in Afghanistan and Iraq. When he was stationed at Camp LeJeune in North Carolina from 2005 until 2010, McGowan used same-day registration to register and vote during the early voting period in the state. He relocated to Georgia in 2010 because of his military service and returned to North Carolina in 2014. On the first day of early voting this year, McGowan arrived at his new polling place in western North Carolina to update his registration and vote, like he had done in the 2008 presidential election, but this time he was turned away. North Carolina eliminated same-day registration as part of the sweeping voting restrictions enacted by the Republican legislature in the summer of 2013. The registration deadline had passed, and McGowan was unable to update his registration and vote. “All I want to do is cast my vote,” the disabled veteran said. After fighting for his country abroad, McGowan felt betrayed by not being able to vote when he returned home. Sadly, McGowan’s story was not atypical this election year. Voters in fourteen states faced new voting restrictions at the polls for first time in 2014—in the first election in nearly fifty years without the full protections of the Voting Rights Act. 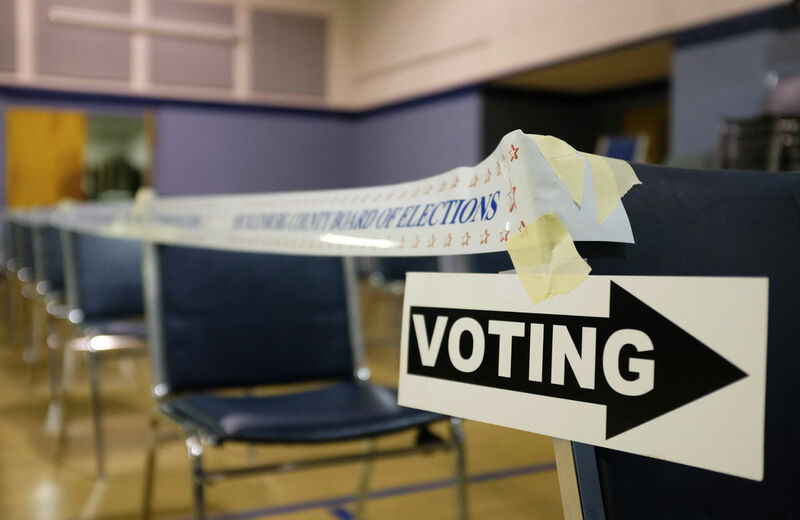 The number of voters impacted by the new restrictions exceeded the margin of victory in close races for senate and governor in North Carolina, Kansas, Virginia and Florida, according to the Brennan Center for Justice. In the North Carolina senate race, Republican Thom Tillis, who as speaker of the North Carolina General Assembly oversaw the state’s new voting law, defeated Democrat Kay Hagan by 50,000 votes. Nearly five times as many voters in 2010 used the voting reforms eliminated by the North Carolina GOP—200,000 voted during the now-eliminated first week of early voting, 20,000 used same-day registration and 7,000 cast out-of-precinct ballots. Lawyer Allison Riggs of the Southern Coalition for Social Justice in Durham flagged dozens of stories of disenfranchised voters and election problems in North Carolina. Voters were not able to register during the early voting period. There were longer lines during early voting because the state cut early voting by a week. And there were longer lines on election day because of the shorter early voting period, particularly in heavily Democratic urban areas like Durham, Raleigh, Charlotte and Greensboro, where wait times stretched to over two hours at some polling places. 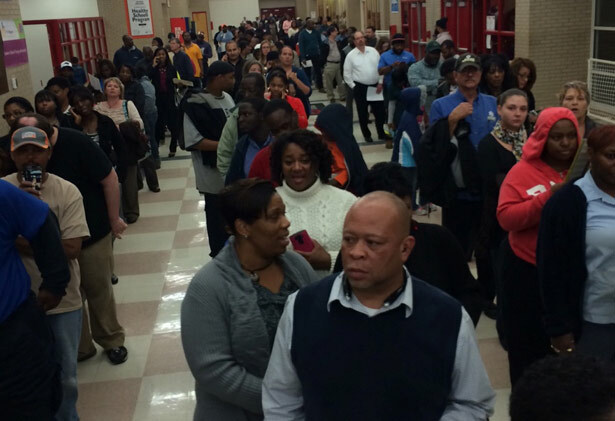 This was the line at the Southern High School precinct in Durham County. Leslie Culbertson arrived at her polling place in Charlotte’s Eastover Elementary School expecting to quickly cast her ballot. “The last time I voted here the line was nothing,” she said. But this time the wait was an hour and Culbertson had to leave the polls without voting to pick up her children from school. Many voters also arrived at the wrong polling location, where they could no longer cast a regular ballot out-of-precinct. 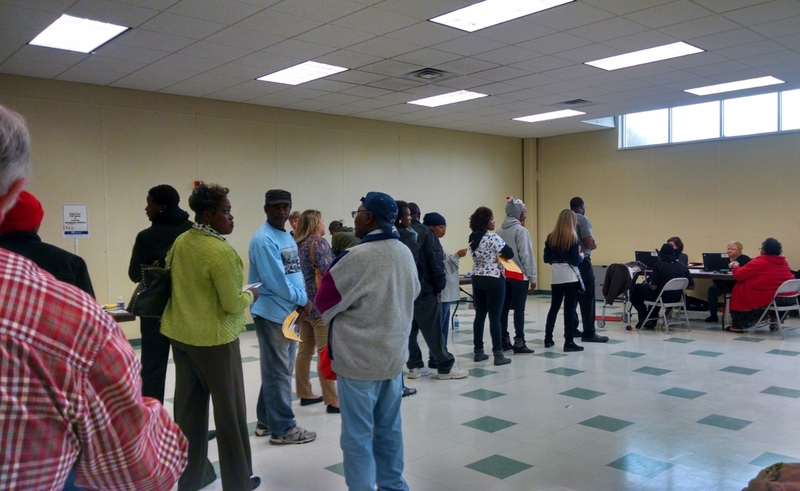 Here’s a photo of voters waiting to cast a provisional ballot at the Chavis Community Center in Raleigh, located in a predominately African-American, low-income part of town. There were 216 voters in the line as of 3:30 pm on Election Day. The provisional ballots they cast will most likely not be counted. “We were getting tons and tons of calls from voters who were turned away because they were at the wrong precinct,” Riggs said. More than 450 voters were disenfranchised in North Carolina’s primary because the state eliminated same-day registration and out-of-precinct voting. Riggs expects that number will be significantly higher for the general election, even as turnout increased in North Carolina compared to 2010 for the early voting and general election period. “The real question is what would turnout have been like if these voters hadn’t been disenfranchised?” she says. Nationally, voter turnout in 2014 has been estimated at 36.6 percent, the lowest level since 1940. In North Carolina and across the country, the electorate was older, whiter and more conservative than in 2008 and 2010, which is exactly what Republicans wanted. The new voting restrictions contracted an already-minuscule electorate. Nearly twice as many Americans chose not to vote as voted in 2014. As turnout decreased, voting problems increased. The Election Protection coalition received 18,000 calls at the 1-866-Our-Vote hotline, a 40 percent increase over 2010. Some of the starkest examples of voter disenfranchisement occurred in Texas, where scores of voters were prevented from casting ballots because of the state’s discriminatory voter ID law. “We saw out and out disenfranchisement,” says Myrna Perez of the Brennan Center for Justice, who monitored voting problems in Texas on Election Day. Six hundred thousand registered voters don’t have the required voter ID in Texas but the state issued only 407 new voter IDs as of Election Day. “There are more licensed auctioneers (2,454) in Texas than there are people with election identification certificates,” reported the Texas Observer. 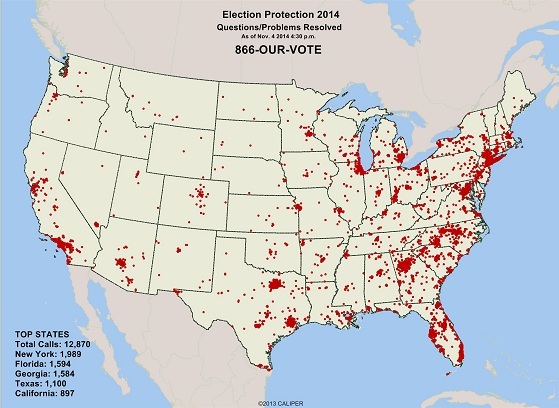 It was a grim election for voting rights. Many of the Republican politicians who led the effort to make it harder to vote were re-elected or elected on Tuesday, such as Tillis in North Carolina, Greg Abbott in Texas, Rick Scott in Florida, Scott Walker in Wisconsin, Kris Kobach in Kansas, Jon Husted in Ohio. With more states under GOP control, the highest number since the 1920s, expect new states to pass voting restrictions in the near future. In Nevada, which is now controlled by Republicans, GOP strategists are already urging the Republican legislature to swiftly enact a new voter ID law. Since Republican legislatures across the country implemented new voting restrictions after 2010 and the Supreme Court gutted the Voting Rights Act, it’s become easier to buy an election and harder to vote in one.